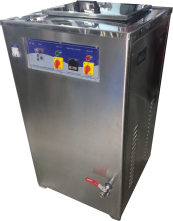 An Ultrasonic Filter Cleaning Machine in Mumbai , India can be much more effective and less damaging than using a brush or high-velocity water sprays that no matter how diligently applied are not able to access all filters surfaces and may in fact damage the filter. Moreover an ultrasonic filter cleaners will cut filter cleaning time to minutes compared to the time required for manually cleaning filters. LeelaSonic has developed Ultrasonic Filter Cleaner / Ultrasonic Cleaning Equipments for successful cleaning of Filter. No more hand and mechanical brushing is needed to remove contaminated with grease, hydraulic oil, rust, grime, carbon, aluminum shavings and material gassing , residual polymer on Filter. Used for cleaning industrial Filter , nut, bolt, engine filters, aircraft Filter, hydraulic filters. The Two-tank ultrasonic cleaning and rinsing machine designed for lower volumes of Filter are cleaned and rinsed manually by operators. A compressed-air Drying Wand is also included to permit operators to dry Filter after the rinsing process is completed. Controls are enclosed in a electrical enclosure of steel enclosure to eliminate the possibility of corrosion. Systems also include drain and fill ports with ball valves to provide for easy liquid maintenance operations. Ultrasonic Cleaning, Rinsing, and Compressed Air Drying in a Single Cleaning System. All Components are Easily Accessed for Maintenance Operations. Available with Pulse Sweep Energy Ultrasonic Systems. SS Control Enclosure Provides Ease of Operation while Eliminating Potential Corrosion. Inbuilt Digital Timer & Digital Temp. Controller. 9" X 5.5" X 4"
Higher capacity also available as per customer requirement. of Ultrasonic Cleaners / Ultrasonic Cleaning Equipments / Ultrasonic Washing Machine/ Brass Pars Cleaner / SS Parts Cleaner / Auto Mobile Parts Washer / Ultrasonic Filer Cleaner / Aircraft Parts Cleaner.